Stop the presses! (or should I say, letterpresses?) Our holiday poster was featured on FPO. We are honored to be featured on this blog, because c’mon, WHO WOULDN’T!! A bit of background, FPO (For Print Only) is a division of Under Consideration, a network dedicated to the advancement of the graphic design profession. 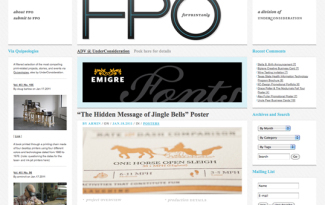 FPO is … Continue reading We are on FPO!